We would like to thank Dark Flight Games for the print and play version of Poison Bottles that was used for this preview. Other than receiving the print and play copy of the game, we received no other compensation from Dark Flight Games. This preview uses a print and play version of the game so things about the game may change before the final version of the game is produced. To score the least amount of points at the end of the game. Each player is dealt 9 cards in a 3X3 grid face down. After all of the players are dealt their nine cards face down. Each player is then dealt five cards for their hand. Starting with the first player each player plays one of their cards face up to the middle of the table. The first player chooses the color for the current trick by playing one of their cards face up on the table. The rest of the players then play a card. If the player doesn’t play a card of the trick color they can’t win the trick. The player who plays the highest card of the trick color will normally win the trick. If one of the players plays a poison bottle though, the player who plays the lowest number of the trick color wins the trick. If two poison bottles are played it reverses back to the highest number and so on. The player who wins the trick will get to lead the trick taking phase of the next round. Any player that played a poison bottle card gets to take the poison bottle card and sets it aside since it will be worth -3 points at the end of the game. Each player gets to secretly look at one card from any player’s board (including their own or another player’s). The player looks at the card and then places it face down on the same spot where the card was originally taken from. After every player has looked at one card, each player chooses one of their own cards to place their rat token on. This phase is only done by the players that lost the trick taking phase. Each losing player picks one of their cards from their 3X3 board. They look at the card and then choose a card from their hand (not the card they just picked up) to replace the card with in their 3X3 board. This card is placed face down. This phase is only done by the player that won the trick taking phase. The winning player will take one card from each player’s 3X3 grid and replace it with a card from their hand. The winner can’t take the card that the player put their rat token on. The winner looks at the card taken, chooses one card from their hand (not the one they just drew), and places the card face up in the corresponding place in the other player’s 3X3 grid. These face up cards stay face up for the rest of the game. Each player draws one card so each player has five cards in their hand for the beginning of the next round. If the draw deck does not have enough cards for each player to draw another card, the game ends if it is a three player game. If there are four players the discard pile (cards other than the poison bottles played in the trick taking phase) are shuffled and the game is played until the cards run out again. When the game ends each player gets to take one additional swap action. Every player then turns all of the cards in their 3X3 grid face up and scoring is completed. Each card is worth its’ numerical value and poison bottles are worth eleven points. Players can reduce the number of points earned if they get three cards of the same value in a row or column (not diagonal). If a player achieves this, they score zero points from the three cards from that row or column. If a player gets three poison bottles in a row or column they score -30 points. Whichever player scores the least amount of points, wins the game. I would like to reiterate that this preview is based on a print and play version of the game sent to us by the developers of the game. This version of the game may not be finalized and there may be changes before the final version of the game is produced. After playing the game though it appears that the game is finalized or is very close to being finalized. With so many different genres of board and card games, there are some genres that I prefer over others. Three genres that I wouldn’t consider my favorites are trick taking, memory and “take that” games. I don’t hate these genres but I usually don’t play a lot of games in the genres because there are other genres that I prefer. Poison Bottles is an interesting game since it actually combines all three of these genres together into an interesting card game. This unique combination of genres is why I wanted to try Poison Bottles. Despite not being a big fan of any of the genres by themselves, Poison Bottles is an interesting and fun blend of different genres. Not being a big fan of any of the main genres used in the game, I have to say that if you are not a big fan of trick taking, memory, and/or take that type of games, I don’t know it you would like Poison Bottles. I had fun with the game and would play it again but it isn’t a game that I would play all of the time and it didn’t make me change my mind on any of those genres. That said if you like one or more of the genres I think you could get a lot of enjoyment out of the game. The reason I tried the game was that it looked like an interesting combination of different genres. I like games that try something new and I felt that Poison Bottles was interesting enough that it warranted trying. For the most part I think the game does a good job blending the different genres into an interesting game. Of the three genres I would say that the “take that” mechanic plays the biggest role in the game. This mechanic is likely to play a big role in who ultimately ends up winning the game. While only one player can mess with the other players each round, they can drastically affect the other players. Since the game relies heavily on creating rows and columns of matching cards, you can really mess up another player’s strategy by taking one card from their board. Players can protect one of their cards each round but if another player figures out what you are trying to do they can still mess with your plan. The game kind of has a deception element as you try to deceive the other players so they don’t mess with your strategy. I kind of wish the “take that” element had a little less impact in the game though since it seems kind of overpowered at times since it is so hard to succeed in your strategy without another player messing with it. The next biggest element in the game is the memory element in my opinion. If you have a bad memory you are not going to do well in the game. At the very least you have to remember your own 3X3 board. If you can’t remember your own board it is going to be really hard to create combinations that prevent you from scoring points. If you can’t remember your own board you will only win if you luck into a victory. While it is not necessary to know the other player’s boards it could be really helpful since it can tip you off to what the other players are trying to do so you can mess with their strategy. While having a good memory won’t win you the game, it can help you immensely. Finally there is the trick taking element of the game. The trick taking element is important to the game but I don’t think it plays as big of a role as the other two elements. I don’t think the trick taking plays as big of a role since there are positives and negatives of winning/losing tricks. To win the game you need to do a good job timing your wins and loses. If you win every trick you can really mess with other players but you can’t help fix your own board. If you never win tricks though the other players will keep messing with your set of cards. The key to the game is creating the perfect blend of winning and losing rounds. The game seems to have three main strategies and in the game I played all three strategies were played by different players. The most obvious and the safest strategy is to just put low cards onto your board. Since you want to score the lowest amount of points this makes since and using this strategy will likely keep you from getting last place. You will rarely win the game with this strategy though since eliminating points from some of your cards is key to winning the game. The second strategy is to try and get at least one or preferably two rows or columns with all of the same card. Preferably you want to do this with low value cards since you can then implement the first strategy as well but it also works well with higher valued cards despite being riskier. This strategy is riskier than the first strategy since you could get a lot more points but if you get at least one or two columns or rows of matching cards you have a great chance at winning the game. In most games I would probably recommend using this strategy since it presents the best chance of winning the game. The final strategy is the riskiest strategy and I actually ended up using this strategy which is surprising since I usually don’t pursue risky strategies. The final strategy is to try and create a row or column of poison bottles. This is pretty much the boom or bust strategy. If you can pull it off you will likely win the game but if you fail you won’t win the game. Getting -30 points is huge in the game since it will likely make your final score close to zero. This strategy is risky though since if one player messes with it you will get so many points that you will have no chance at winning the game. The only reason I pursued it was because I was dealt so many poison bottle cards at the beginning of the game. I ended up winning the game because I was somehow able to create a column of poison bottles with none of the other players noticing. Unless you are dealt a lot of poison bottles though I probably wouldn’t recommend this strategy. Overall I would say that Poison Bottles is a light to moderate strategy game. It is the type of game that takes a couple rounds to figure out what your are doing but once you understand the game it is easy to play and moves quickly. After you get used to playing the game I think you could finish a game in 15-30 minutes.I kind of wished the game would be a little longer since it seemed to end a little quickly. Each game lasts less than 10 rounds so you don’t have a ton of time to waste deciding what you want to do. You need to make your strategy choice pretty early and then stick to it. Component wise I would say the game looks pretty good even though I don’t know what the final version will look like. The instructions are well written. The only issue that we encountered while playing the game was regarding what happens when a player chooses to swap out a card that is face up. We didn’t know whether the new card would then have to be put face up or whether the new card would be put face down. Note: After hearing back from the designers I learned that the new card put out is also put face up and the rules will be updated to make this more clear. The artwork on the cards is pretty simple but nice at the same time. I like the simplicity of the cards because they aren’t cluttered with a bunch of worthless information that just distracts from the gameplay. While I really didn’t have any issues with the theme, it really doesn’t affect the gameplay. If you like a strong theme in your board games, Poison Bottles doesn’t have it. The theme could have been changed and it wouldn’t have affected the gameplay. The artwork is nice but I wouldn’t play Poison Bottles for the theme. For these type of games though the theme really isn’t that important so it isn’t much of an issue. I had fun with Poison Bottles. It is an interesting combination of trick taking, memory, along with some “take that” mechanics. I give the game credit for combining three different genres that aren’t usually mixed together. Players who really like at least one of these genres will probably really like Poison Bottles. If you don’t really care for any of the genres though Poison Bottles probably won’t be for you. 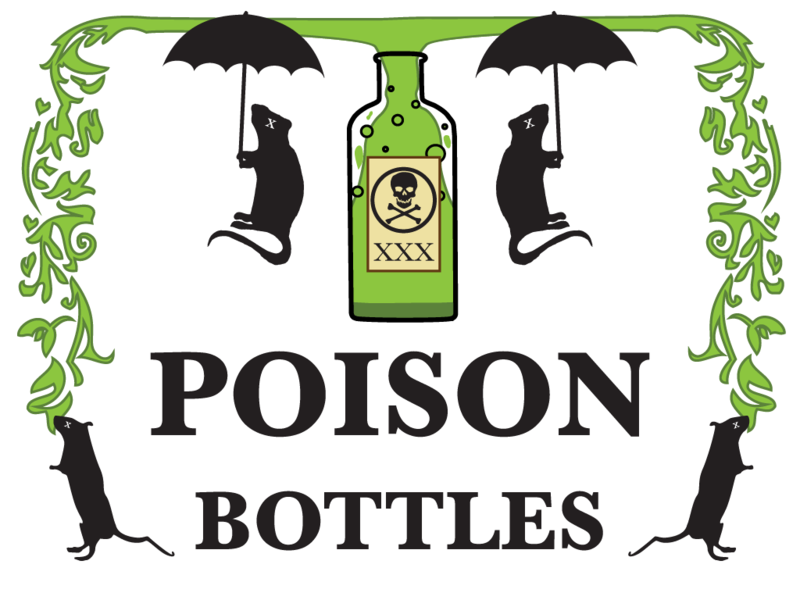 The Kickstarter for Poison Bottles stated on February 13th, 2016 and runs until March 5th, 2016. As of the date of this preview the campaign has already reached its’ funding goal. A pledge of $15 or more will get you a copy of the game. If you would like more information about the game, check out the Poison Bottles’ Kickstarter page. An interesting combination of a trick taking, memory, and take that games. Plays quickly once you get a hang of the game. Probably won't appeal to people who don't like trick taking, memory and/or "take that" games. The theme doesn't really relate much to the gameplay.